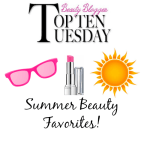 One of the products that I use nearly every day is an illuminator or luminizer. 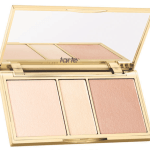 Added to the areas of the face (or body, in some cases), an illuminator adds light and radiance. I’ve tried a fair amount of illuminators/luminizers in my day and my preference is one that imparts a glow, radiance or slight shimmer, but not full-on “glitter” or sparkle. 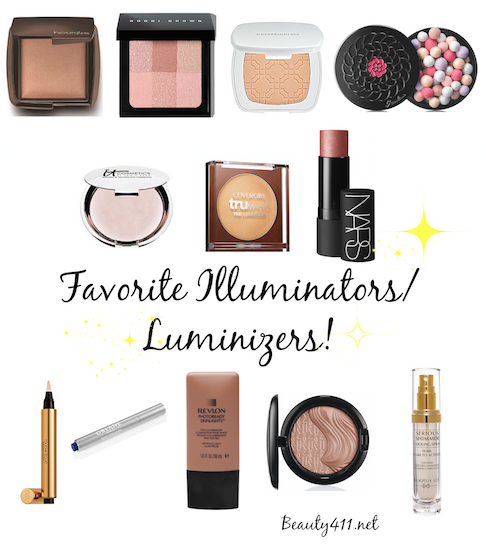 Illuminators or luminizers come in various forms: stick, solid and liquid. 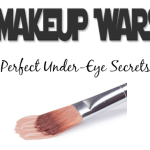 You can apply either under or over your makeup; it’s totally your preference and I actually do both. If I’m using a stick or powder, I apply on top of foundation; if it’s a liquid, I apply on top of primer and before foundation. 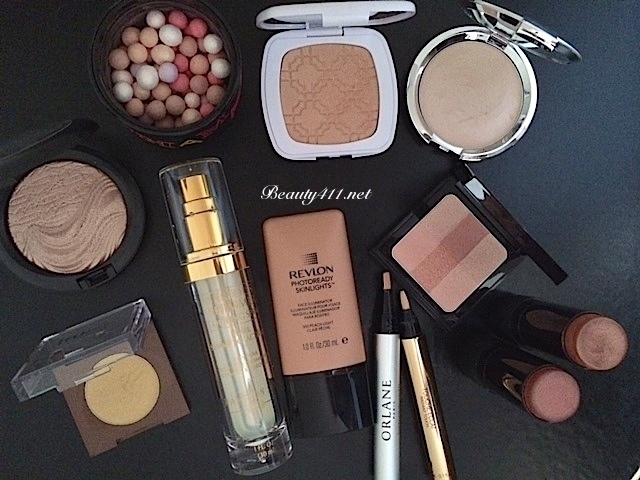 The only product from the list below that I use under my eyes is Touche Eclat. Otherwise, I apply my luminizer to high cheekbones, forehead, down the bridge of the nose and in the “parentheses” around the lips. A new discovery comes from Hampton Sun. The Serious Shimmer Cooling Spray adds a pearlescent glow to skin; it’s gorgeous. It has good-for-your-skin ingredients in it, including Aloe Vera, Grape Seed Extract, Vitamins A through E and has the light scent of the Privet Bloom fragrance (I didn’t notice a cooling effect when I tested, but perhaps when used outside, it would be more noticeable). And here’s a tip for the best application. I’ve named the MAC 217 Brush one of my favorite makeup brushes for expert eyeshadow blending. 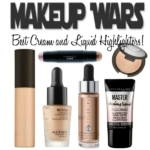 Buy another one and use it to apply your highlighter or illuminator. 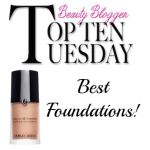 You can use it on creams or powders, plus it’s the perfect size for correct highlighter placement and flawless blending, especially on top of cheekbones. Sweep product on with a back-forth “windshield wiper” type movement. Try it! 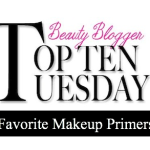 Do you use an illuminator or luminizer? Let me know in the comments! 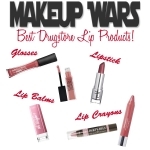 And make sure to check out the posts from the other Makeup Wars beauty bloggers! Disclosure: Some of the above products were provided by the brand/PR for editorial consideration, product testing and review. Others were purchased by me. All opinions are my own. Affiliate links have been used in the post, which means a small commission is earned. I don’t purchase a lot of MAC products, but I have heard such good things about that Extra Dimension Skinfinish! It’s definitely going on my shopping list. Thats it! I need a Guerlain one! I didn’t include any pens! I forgot about all of my pens! Awesome choices. I wish I could buy all of these! I wish Guerlain wasn’t fragranced. I’ve had so many of their face products that I ended up getting rid of because of that but they are so beautiful. All this talk of the matte NARS Multiples has me wanting to make a purchase – might have to add these to the list! I am curious to try that CoverGirl now! Ah Guerlain Meteorites are heaven!